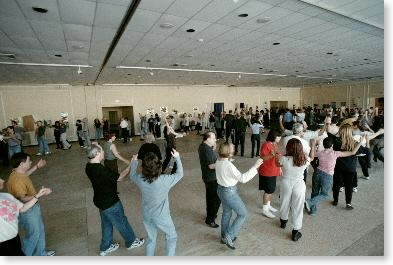 Folk dancing (either Israeli or international) is much easier than, for example, ballroom or social dancing. 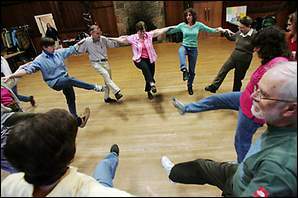 In folk dancing, there are circle, line and couple dances. You learn the dance ahead of time, and then when the music comes on, you just do the dance and enjoy it. You don't have to worry about leading your partner or figuring out what to do as you go along, the choreographer who created the dance has already done that for you. (I never liked going to standard rock-and-roll dances, the music is too loud, I can't hear what anyone is saying, and when on the dance floor I don't know what I want to do next.) You can practice your skills by doing the circle and line dances, before trying to do the couple dances (which are really the most fun, IMHO). Unlike social dancing, the dances and conventions at Israeli dance sessions are not much different from one group to another--if you learn a dance in one city, it will be basically the same in another city, or even in Israel, should you decide to travel there. In social dance, conventions and styles differ widely from one teacher or studio to another. In folk dancing, if there is a dance you really don't like, at least it will be over with in about 3 minutes, unlike in social dancing, where if you have a song or a partner that you don't like, you are stuck with it/him/her for perhaps as long as 10 minutes. If you start with a beginner's Israeli dance session and stick with it by going once a week for 3 to 6 months, you will really learn a lot of dances without much conscious effort and you will see how much fun it is! Ken Avner has an excellent Israeli Dancing page, with some good advice on folk dancing etiquette. You can search for an Israeli dance session in your area at the israelidance.com web site. If you are in the Philadelphia area or in Delaware, below is the information on local Israeli dance sessions. Location: Arden Gild Hall, 2126 The Highway, Arden, DE 19810; Phone 302-475-3126. Time: 2:45 - 5:00 PM. Focus is on beginner and easy intermediate dances. Location: Arden Gild Hall, 2126 The Highway, Arden, DE 19810; Phone 302-475-3126. Time: 7:30-9:30 PM. Focus is on beginner and easy intermediate dances. Occasionally there are schedule changes due to holidays, vacations, and so forth. Here is a newspaper article on the dance session at the Arden Gild Hall. Contact: Tamar Magdovitz; Phone 215-247-9614 or 215-844-1507. Location: Germantown Jewish Center, 400 West Ellet St. (at Lincoln Drive), Philadelphia, PA 19119. Time: 10:00 AM - 12:30 PM. Instructor: Don Schillinger Phone: 215-760-6800. Location: Klein JCC, Red Lion & Jamison Rd., Philadelphia, 215-698-7300. Time: 7:00-11:00 pm. Focus is on intermediate and advanced dances. Instructor: Carole Langsam. Time: 8:00-9:30 PM. Location: Allentown Jewish Community Center, 702 N. 22nd St., 610-435-3571. Focus is on beginner and easy intermediate dances. Time: 7:30 - 10:00 pm. Time: 7:00 pm -10:00 pm. Location: Adath Israel 250 N. Highland Ave.,Merion (Philadelphia), PA 19066. Time: 7:00-11:30pm. Focus is on intermediate and advanced dances. A large number of children attend. Why do you think the percentage of American Jews who do Israeli dancing is so small?